We are all familiar with the benefits of sea air and natural salt caves, but did you know that salt has also been used for over 200 years as a natural therapy for respiratory ailments and skin conditions? Salt therapy dates back over 200 years. The positive effects of salt on the airways were first noted in Eastern Europe in 1843 when a Polish doctor documented how salt mine workers didn’t seem to suffer from the same respiratory problems as the general population. You don’t have to go to the sea or salt mines any more to be able to experience the benefits of salt. The Salt Cave replicates the healing natural microclimate using modern technology, which provides an effective, 100% natural, risk free treatment. In the salt therapy rooms, the microclimate of sea air and natural salt caves is reproduced, monitored and controlled, using a special medical device, called Breeze Tonic Pro. It is programmed to synchronise particle size, concentration, room temperature and humidity and to maintain the optimum, therapeutic environment for each client. Salt therapy provided in The Salt Caves has already helped thousands of people suffering from Asthma, Eczema, Hay fever, Sinusitis, COPD, Bronchiectasis, Bronchitis, Cough, CF and other respiratory illnesses and skin conditions. In 2011, NHS approved salt therapy as an effective treatment for COPD. NHS approved salt therapy is only available at The Salt Cave branches in the UK. If you search for salt therapy on the Internet, you can find dozens of testimonials from people saying how much salt therapy has helped them. Marissa Godden first tried salt cave therapy when her asthma spiralled out of control forcing her to give up full-time work. “I was wheezing and coughing so much I could hardly walk a short distance and my chest was very sore,” she says. “Someone suggested the salt cave and I thought I’d give it a go.” After two sessions her sinuses started to clear and she could breathe through her nose again. By the fourth session her chest felt less tight and painful and her breathing began to improve. After 20 sessions Marissa’s improvement was evident in a peak flow meter which measures airflow out of the lungs. Marissa’s reading had been a very low 200-250l/min (litres per minute). After her course of treatment her airways were much clearer and her level rose to 300l/min which is closer to a normal reading of between 400 to 600l/min. Salt is known for its bactericidal effect. Nowadays, salt is even used in swimming pools instead of chlorine to kill bacteria. It is also very effective in killing bacteria found in the mucous.In most patients, after a course of Salt Therapy, airways become normal and symptoms subside. 85% of patients with mild and moderate bronchial asthma, 75% with severe bronchial asthma, and 98% with chronic bronchitis, bronchiectasis and cystic fibrosis improved after Salt Therapy. The patients were examined 6 and 12 months after their first Salt Therapy course. Salt Therapy is also recommended for Children with Respiratory Illnesses and Eczema, there is no age limit. They react more intensively than adults do, thus natural healing methods are even more effective with them. 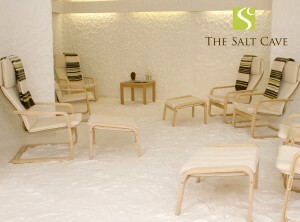 Call 033 3344 0533 or visit www.saltcave.co.uk for more information about salt therapy or to book your appointment. WOW that’s amazing. I never knew about salt therpy for asthma. Mine is pretty well under control at the moment after discovering that it was soya causing it… but if it gets worse I’ll check this out. Have you any experience of the buteyko breaking technique? I read through this article on Salt Therapy. Very interesting and optimistic and at the same time perhaps economical. It is sad that large medical conglomerates like Pfizer etc do not undertake research and trials of this economic treatment and scientifically establish its efficacy. The reason is very obvious : they can not make a huge pile of money. In fact they may lose sales of existing products being sold for COPD. Even if they carry out such a study, the entire process should be under the supervision of well qualified scientific personnel, deputed by National Health Service, UK , UN arm for medical reaserach, German Govt medical authorities etc. Otherwise, these rich conglomerates would finance and produce a negative result so that they can continue to sell their products. Better still, these independent Govt / UN set ups should come together, pool their finances and carry out the research themselves. That way, perhaps, the genuineness of this therapy may be irrevocably established. All this is only a wishful thinking. Perhaps in matter of few years, such a public-benefiting activity may be carried. We can only pray to God. Anyway, the first step has been taken; on empirical results, NHS has recommended salt therapy as an viable alternative to drugs. That itself is great. I am 70 years old, live near Mumbai (India) and have been diagnosed as having COPD since 2 years. For people suffering from COPD, it is important for them to know that they are not alone. I was also a victim. I had experienced shortness of breath, coughing, recurring chest infections and bronchitis. But I didn’t realize that I had COPD until I went to my doctor and was diagnosed with COPD. The first thing I did was get myself informed. Having COPD hasn’t slowed me down. Even though I had COPD I still played golf and involved myself in different exercise though I started smoking at 19 years of age I smoked almost a pack a day. The doctor had told me to quit smoking, it was frightening and frustrating, I thought it was to avoid stress. I learned about Dr. Lance Herbal Medicine from a friend. Now my life has turned around for good because I consider myself most fortunate. There are so many people out there who have COPD and don’t realize it. If you have COPD, many things are available to help you live a full, comfortable life don’t be ashamed of it.